You can eat those fries in peace. Potatoes have been vilified by dieters for what feels like forever—but whether it's home fries with brunch, chips with your sandwich, or fries with your burger, it takes a whole lot of willpower to steer clear of the starchy staple. 1. It's true that potatoes can spike your blood sugar, but that's not the whole story. The root of the potato's bad reputation can be traced to the glycemic index, a tool nutrition experts use to compare one quality among different foods: how quickly they're broken down into sugars and dumped into the blood stream. When foods are broken down especially quickly—I see you, potatoes!—the body responds by releasing insulin to sop up all the sugar. The problem, according to Adrienne Youdim, MD, founder of the Center for Weight Loss and Nutrition at Lasky Clinic in Beverly Hills, California, is that this leaves you high and dry on energy, and prone to cravings and hunger—even though you literally just ate. It's a hangry cycle that can make it tough to manage your weight. 2. There are much worse things you can eat than plain old potatoes. Even though colorful foods tend to be more celebrated for their nutritional density, white potatoes still provide you with filling fiber, a bit of protein, and plenty of nutrients to boot: B6, Vitamin C, Magnesium. 3. The way people eat potatoes really ruins potatoes' reputation. 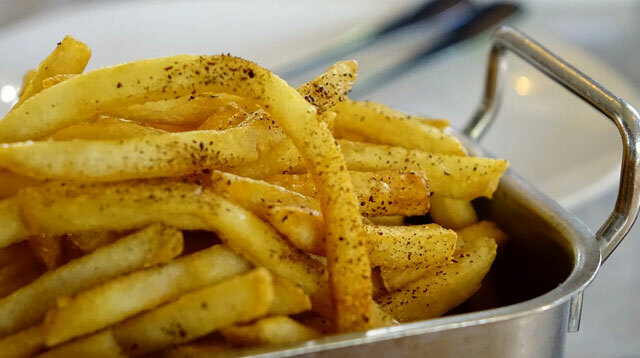 "No one eats french fries by themselves, and it adds up," Dr. Youdim warns—but that's no reason to blame the potatoes themselves. Considering how much people hate on processed foods and harp on clean eating, you certainly can't fault the potato for being overprocessed. 4. The real problem with potatoes is eating them in large portions. 5. Some starches are superior to white potatoes. At the end of the day, potatoes are roughly comparable to white rice, nutritionally—and only slightly better for you than white bread, according to Dr. Youdim. Yams and sweet potatoes get extra credit for serving up loads of vitamin A. No one is saying potatoes are the devil—or that you should eat them at every single meal. There's nothing wrong with eating baked, roasted, or boiled potatoes a few times a week—or springing for a bag or chips or reasonably sized order of fries because you feel like it. Just realize that fried potatoes are very different from (and less healthy than) the innocent potato that you started with, and sugary condiments don't make things any better. Also know that more colorful options like squash will deliver extra nutrients when you're craving something starchy, while whole grains and legumes (or potatoes paired with protein) are likely to give you a more even-keeled flow of energy than a lone potato.